At RHRLI, we know that we can help transform your life. Hair is important, and it has a huge effect on how you look and how you feel about yourself. Appearance and self confidence goes hand in hand and it’s one of the reasons why we’ve dedicated our practice to giving patients strong, healthy hair. We offer the best permanent solution on the market to hair loss and thinning hair. It’s called the ARTAS® System and RHRLI is the only hair treatment center on Long Island that offers this revolutionary procedure. And while ARTAS® will give you a lasting solution to hair loss, we also want you to know about some of the other benefits of this procedure. When you come to RHRLI to consult with our doctor Baiju Gohil MD, he will take you through the steps of an ARTAS® transplant. We use cutting edge robotic technology to identify healthy donor hairs. Then we transplant them to where they’re needed to give you the healthiest head of hair you can find. There are other benefits to the ARTAS® system and one of them is hairstyle freedom. RHRLI and ARTAS® makes your life a lot easier after the procedure and we want to tell you why. According to the ARTAS® website, the robotic arm targets each individual hair for transplant during the FUE procedure. But the FUT transplant is far different. It requires removing a strip of the patient’s scalp. The result is that stitches are going to be needed when an FUT procedure is finished. This is going to leave a scar when you’re finished, the scar will be linear and will run horizontally across the back of your head. This is going to matter once the procedure is over because FUT patients may be required to wear a long hair style after their procedure is finished. But you don’t have to worry about this with the ARTAS® system. When you’re done with your procedure you won’t have a prominent linear scar. Most patients also report little to no pain following their transplant. You’ll be back to work and normal activities in just a few days with ARTAS®. You’ll also have hairstyle freedom. You can wear any type of hairstyle you like once the procedure is over. 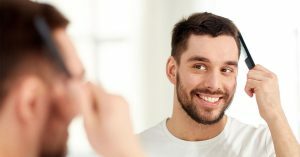 It is often recommended that you cut your hair shorter prior to having the ARTAS® transplant in order to make the change in your hair less noticeable. Some salons will be familiar with what type of haircut you’ll need, and some additional trimming may be done when you come in for your transplant. When you come to RHRLI we’ll explain every step you’ll take on the way toward creating your new look. We’ll explain how the ARTAS® system has more precision than other procedures and how quickly you’ll be back to your normal routine. You can start the year with a new look of your choosing and RHRLI can make it happen. Contact us today.